The G7 Ministers of Culture signed "The Florence Declaration"
The first ministerial meeting on Culture ended with the signing of a joint Declaration condemning the destruction of cultural sites and calling upon the international community to intensify their fight against the illegal trafficking of cultural goods. It is up to the international community to protect archaeological sites, monuments, works of art, libraries and archive heritage in war zones. The document follows Resolution 2347 on the protection of world heritage, unanimously approved by the UN Security Council. 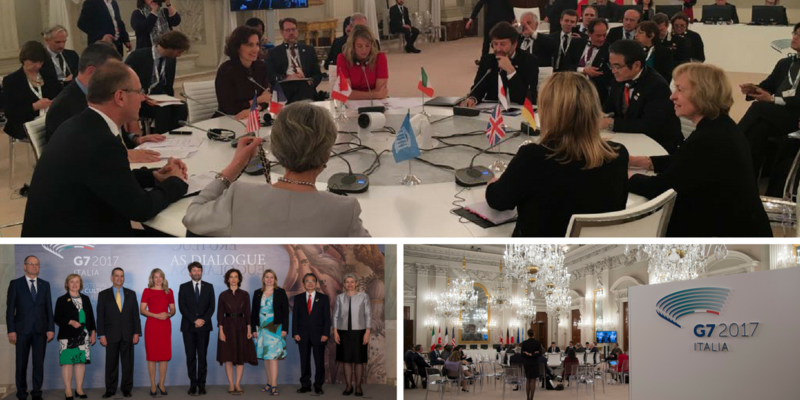 The Declaration was signed in the Sala Bianca of Palazzo Pitti in Florence by Ministers and other Culture representatives from the G7 countries: Dario Franceschini (Italy), David Bruce Wharton (USA), Karen Anne Bradley (UK), Maria Bhömer (Germany ), Audrey Azoulay (France), Mélanie Joly (Canada) and Ryohei Myata (Japan). The European Commissioner of Culture Tibor Navracsis and UNESCO Director-General Irina Bokova attended the ceremony as well.